If you’re in the Haleiwa area you have to stop at Waialua Bakery and Juice Bar located on 66-200 Kamehameha Hwy next to Malama Market. People have been coming to this family owned and operated bakery for their healthy and tasty sandwiches that are made with in-house fresh baked bread. They also have fresh fruit smoothies made with produce grown in their own garden in Waialua. 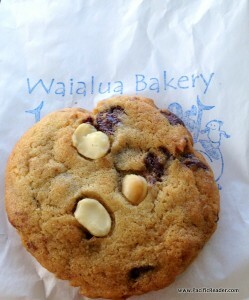 The sandwiches and smoothies are awesome here, but the main reason why I ALWAYS stop here on my way through Haleiwa is they have the BEST cookies and bars! Everyday they make a display case full of cookies with choices like chocolate chip macadamia nut, coconut dream, snicker doodle, oatmeal chocolate chip, wonder bars, turtle balls, and much much more. You name it, they have it! They even make cinnamon rolls on some days and make gluten free cookies too! The best thing about Waialua Bakery is that the cookies and bars are so reasonably priced at $1 a cookie and $2 a bar, you can get an assortment of cookies and bars without spending a fortune. All the baked goods are made with the best ingredients (like tons of real butter), so these cookies are the real deal like the ones you use to get at your grandma’s house (if she is haole and lives in the mid-west). But all jokes aside, this bakery is truly one of my favorites and I’ve gotten all my friends and family hooked on their baked goods. They are open Monday thru Saturday from 10 am to 5 pm, and just a reminder, this place is a cash only spot, but shirts are and shoes are optional.